Come and make a 5x7 (approx.) 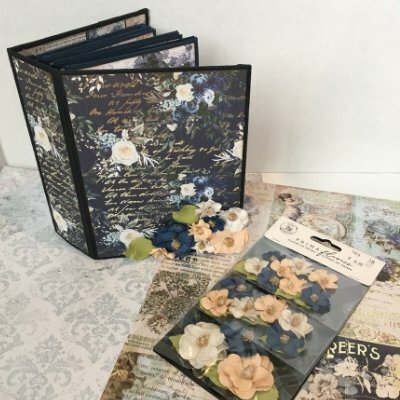 mini album from start to finish, including building the "shell" with hinge system for the spine, adding all the pages with flips and pockets, and decorating using Prima's "Georgia Blue" papers. Julie and Birgit have made dozens of these albums and they will guide you through the creation process, as well as share their tips and tricks. You will be hooked and want to make many more on your own! Materials Included: All paper, scor-tape, flowers and gems are included.